Dr. Jessica Pizzillo is originally from Virginia Beach, Virginia. She earned her bachelor of science from Old Dominion University in Norfolk, Virginia, and her Doctor of Veterinary Medicine from Virginia Tech University. Following veterinary school, Dr. Pizzillo completed an internship in small animal medicine and surgery at Veterinary Emergency and Referral Group in Brooklyn, New York. After seven years of practicing in Brooklyn, she moved to Las Vegas to escape the cold winters and to be closer to outdoor recreation. Dr. Pizzillo joined the Pet Health family in the spring of 2017. She currently shares her home with Isabella (a perfectly sassy geriatric pitbull), Duncan (an adventurous cat and BFF to Isabella), and Lola (a robust feline who is a connoisseur of kibble and sunbathing). 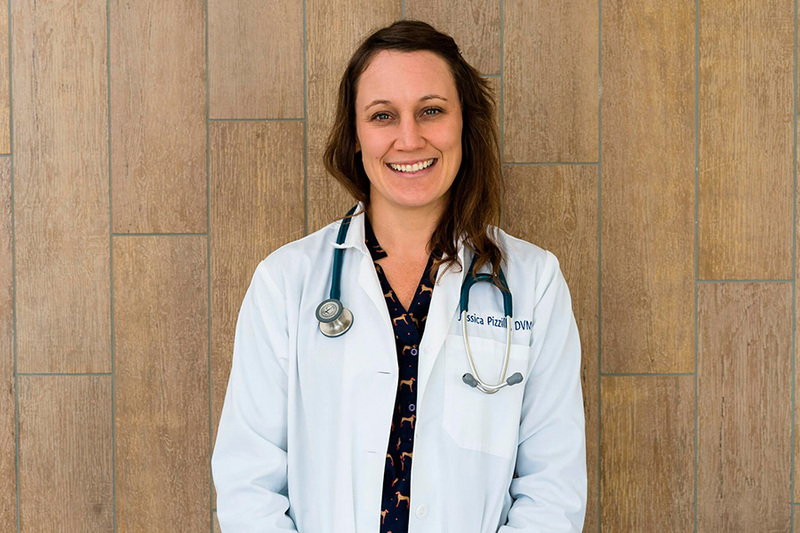 When Dr. Pizzillo is not working, she enjoys exploring hiking trails with Isabella, rock climbing, experimenting with vegan cooking, and sometimes just cuddling up on the couch with the mammals and a good book.